As the power of the internet spreads more of our collections wider and wider, online sleuths help museum curators to identify images that have lain anonymous for decades in archives and storage cabinets. Nicole Cama writes of one such case. RECENTLY THE WORLD MARKED FIVE years since the launch of Flickr Commons, an online image-sharing facility that has been embraced by many museums as a way of getting their holdings out to a wider audience – and tapping into a worldwide bank of knowledge and enthusiasm. In those five years, about 250,000 images from the photographic collections of 56 different libraries, archives and museums – including some of our own – have been uploaded. Audiences around the world have embraced the spirit of The Commons, putting their own time and energy into researching people, places and key events in previously unidentified images. Here is one of my favourite photographs from the museum’s Samuel J Hood Studio Collection – the Sydney photographer whose work appears on the previous pages. For me, it’s one of the most beautiful portraits I have seen, and we published it in Signals No 100 last September (page 25) even though the identity of this stylish young woman had remained a mystery as I researched that story. 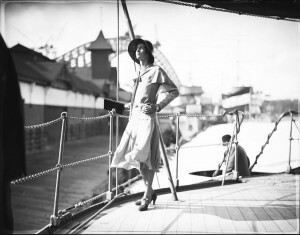 She was part of Sam Hood’s coverage of the October 1930 visit of a Dutch warship, HNLMS Java, and an onboard reception that attracted the cream of Sydney’s fashionable society. Time and time again I would go back to this photograph, trying to spot the elusive clue that would lead to a name and then, hopefully, to a story. I wasn’t alone. Ever since we posted this image on the photo-sharing website Flickr Commons, it has had users spellbound. So imagine my delight when one of them, doing their own research recently, stumbled across her name and let me know! They had found the answer on page 52 of the November 1930 edition of The Home quarterly magazine, which had first published our Samuel Hood photographs depicting that reception on HNLMS Java. She was Miss Hera Roberts, Sydney painter, designer, illustrator and socialite. A 1929 advertisement described her as a lady with ‘amazing fair’, and her appearance in The Home was no coincidence. Hera designed and illustrated more than 50 of its covers and was considered an arbiter of taste when it came to interior decorating. The Home, subtitled Australia’s ‘Journal of Quality’, was dedicated to all that was sophisticated and à la mode in the world of art, interior design and fashion, during an era marked by the bold and modern exuberance of Art Deco. Hera 1924 by George Lambert, oil on canvas. National Gallery of Victoria, Melbourne. Felton Bequest 1925. Hera Roberts was also a muse to many of Australia’s most talented artists and photographers. Max Dupain and Harold Cazneaux both captured beautiful portraits of her, and Thea Proctor, her cousin and one of Australia’s most renowned female artists, also paid homage to Hera in her work The rose (1927). 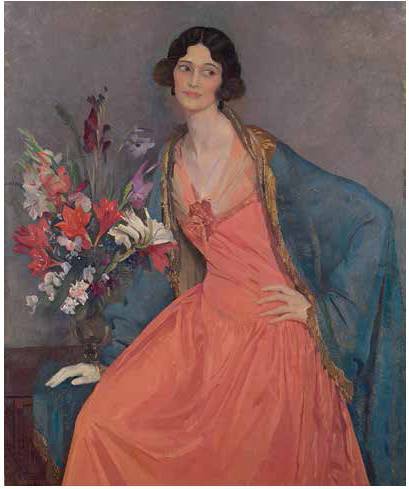 George Lambert painted what for me is the most beautiful portrait of her, in 1924. The work, reproduced here courtesy of the National Gallery of Victoria, depicts a youthful Hera in a pose strikingly similar to Hood’s photograph, hand on hip, neck craned to reveal her slender figure. This world of Sydney fashion and aesthetics has been opened up to us, firstly through a glass-plate negative from our collection of the life’s work of that talented photojournalist Samuel J Hood, and then courtesy of one of the super sleuths of Flickr Commons. So to our helpful online researcher who goes by the username ‘quasymody’ … thank you! NOTE: This story was originally published in Signals magazine, Issue 102, Mar-May 2013, pp 18-19. Reproduced courtesy of the Australian National Maritime Museum.